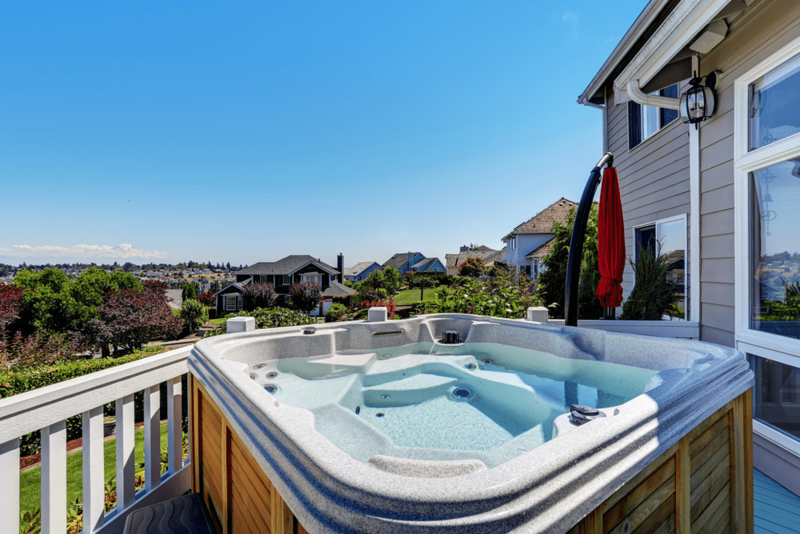 If you want to be the envy of everyone in your neighborhood, then take your lawn care to the next level. Aeration is the key for effective plant and grass growth. Here we are providing you with the best manual lawn aerators that will give you the greenest looking lawn in your neighborhood. You can spend countless hours trying to enhance the appeal of your lawn. With the right tools, such as a manual lawn aerator, you can turn your average looking lawn into a bright green attraction! We reviewed many manual lawn aerators and are sharing our top favorites for you to consider. Lawn aerator shoes allow water, air, fertilizer and other nutrients to get into your soil and grass roots. This improves the overall health of your lawn and results in stronger grass roots. The Punchau lawn aerator shoes have 3 strong straps with metal buckles. They have a sturdy base with 12 2-inch spikes on the bottom of each shoe. 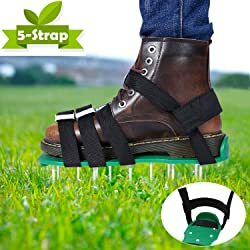 You can simply aerate your lawn by wearing these spiked sandals and walking across your lawn. 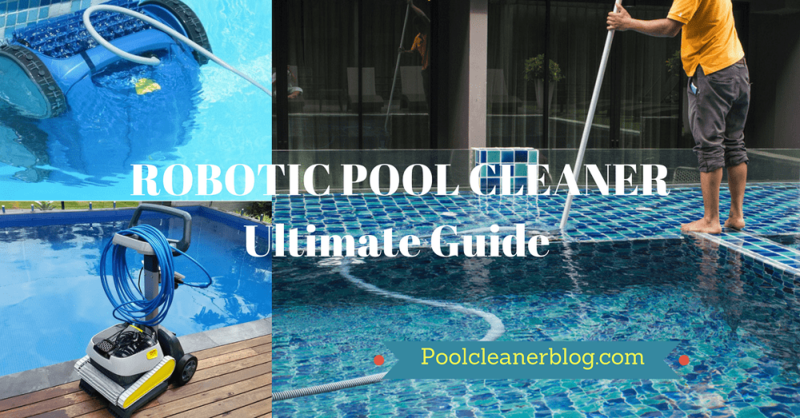 The Punchau aerator shoes can aerate dirt, sand and even hard clay. These shoes are one size fits all and are not pre-assembled. Try these aerator sandals on your lawn and you will see greener, healthier grass in no time! The Yard Butler coring aerator has two spikes on the end of the tool. It will remove two 3 ½-inch deep by ½-inch wide grass plugs from your yard. This allows air, water and fertilizer to get down to the roots of your lawn. The core pieces also reduce water runoff as the soil will now be more absorbent. This product is a hand-held tool that has a foot bar for additional leverage. 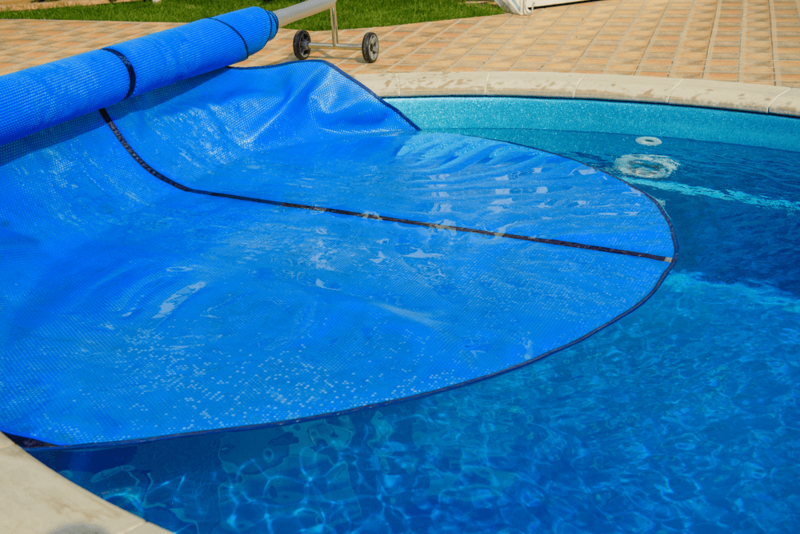 It is perfect for smaller yards and the durable steel gives this product a long life. The overall tool height is 37-inches. 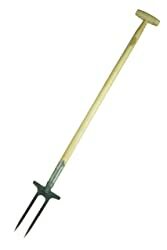 The tool design helps reduce back strain while aerating your lawn. 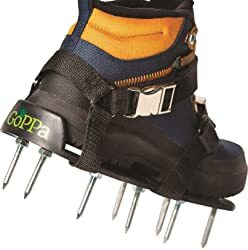 The GoPPa lawn aerator shoes are easy to fit and comfortable. 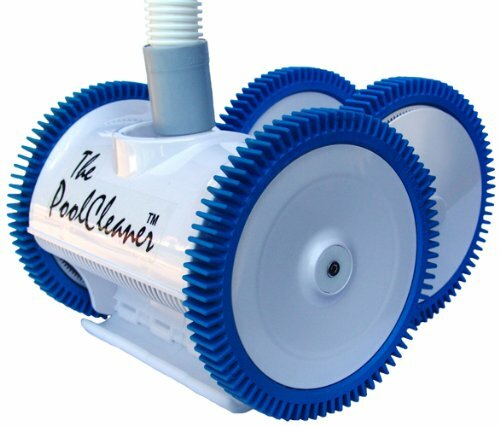 These are one size fits all aerators you only need to fit once to your gardening shoes. The sandals are fully assembled and even comes with spare parts. The fixed fixed strap system on these sandals keep the straps from sliding after you fit it to your shoes. There are two strong metal buckles on these aerator shoes to hold them tightly on your shoes. With proper adjustment, these aerator shoes can fit even smaller shoe sizes, making this a great choice for anyone. 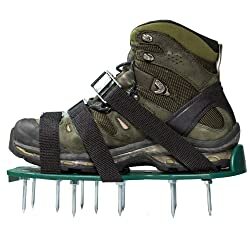 These aerator shoes come with a total of 26 steel spikes. The product comes with a 100% satisfaction guarantee making this a risk-free investment for your lawn. If you are looking for heavy-duty spiked aerator shoes, then consider this Ohuhu product. These shoes have a sturdy plastic base that provide support for your heels. There are 4 adjustable straps with aluminum alloy buckles to hold the shoes on your feet securely. The heel of each shoe has a special elastic band to maximize stability while you are aerating your lawn. 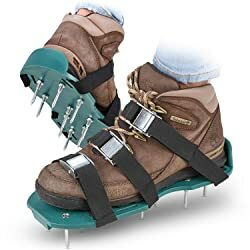 There are 26 heavy-duty spikes on these shoes to break up the ground as you walk and maximize water absorption in your lawn. These lawn aerator shoes are one size fits all. They do not come pre-assembled, but the instructions for assembling these shoes are easy. If you use these aerator shoes, be prepared for an intense muscle tone workout for your calves and thighs! The Abcosport lawn aerator shoes are high-quality, professional grade shoes. These shoes do require assembly. The instructions are simple and the included wrench will help tighten the bolts on the spikes. These shoes have a sturdy plastic base and an extra heel support on the back. There are 13 heavy-duty metal 48mm spikes on each sandal. The 3 adjustable straps have strong metallic buckles to hold the sandals on your feet. The Abcosport lawn aerator spike shoes will break up compact soil so that the roots of your grass can get the maximum water absorption and air flow. After using these shoes, the result will be a stronger, healthier, greener lawn. Abcosport offers a 100% risk-free satisfaction guarantee. This is an economic choice compared to a professional lawn service. 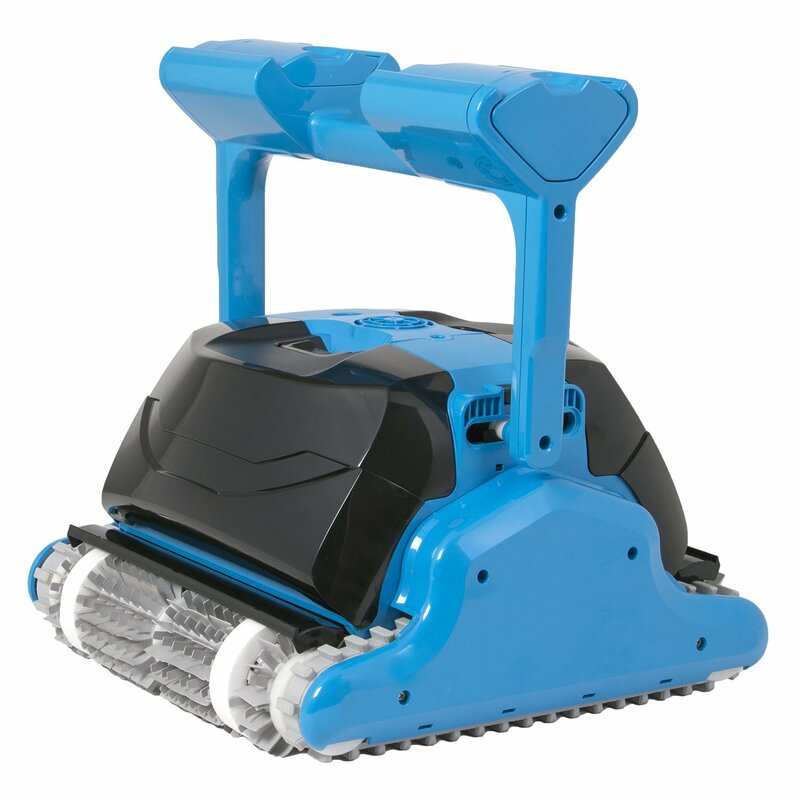 If you are looking for professional grade aeration shoes, then this is the product for you. If aerator shoes are not appealing to you, then consider trying the Yard Butler aerator. 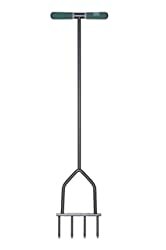 This product is 36-inches tall and has a strong powder coated resin finish that will resist rusting. The Yard Butler aerator has 4 hardened spikes to loosen up all the hard soil in your lawn. Each of the spikes are 3-inches long and provide deep access to the roots of your grass. This lets more water, fertilizer and air to reach the roots and promote healthier, stronger grass. The foot bar on this aerator gives you additional leverage and stability as you are aerating your lawn. This product has a lifetime warranty making this a solid choice for a lawn spike aerator. The DeWit rose bush aerator is a must-have for rose gardens. This aerator is specifically designed to aerate roots. 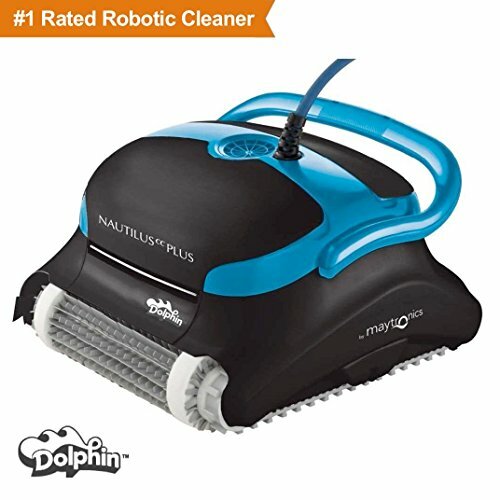 You want to use this after watering your rose bushes when the soil is still moist. To use this aerator, you insert it on each side of the rose bush roots and then lift. It is strong but lightweight and is easy to use. The aerator is 4.5-inches high by 2-inches wide. It is 21-inches long and weighs only 3 pounds! This aerator is high- quality and has a lifetime guarantee. 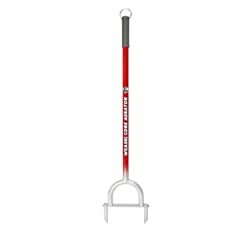 If you use this Garden Weasel product, it will change the appearance of your lawn! The core aerator will activate root growth while giving your lawn’s surface the nutrients it needs to look plush and green. To use the aerator, you grab the handle and place your foot in the stirrup. 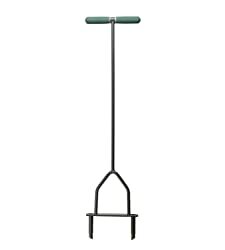 Press down on the metal bar to push the aerator spikes into your grass and penetrate the soil. Repeat this as needed, especially in areas where the grass is looking dull or brown. As you repeat the process of aerating your lawn, the small soil plugs will automatically release through the aerator. These soil plugs will break down on your lawn surface and give your lawn additional nutrients. The Weasel Core Aerator is made with carbon steel. 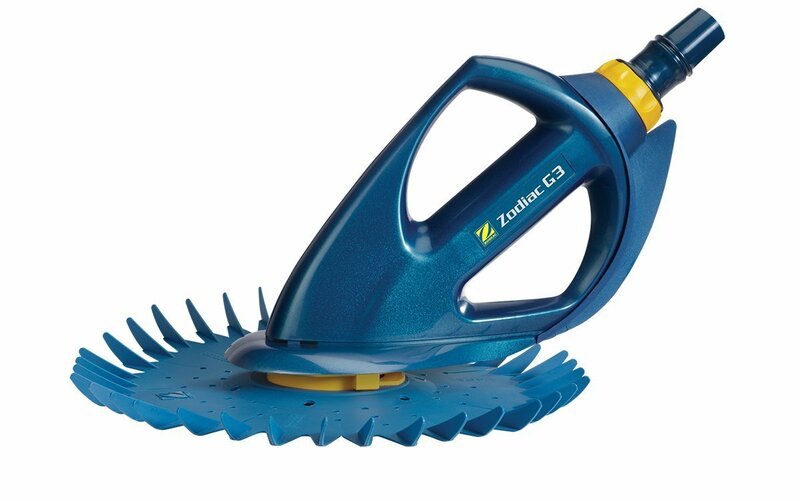 It is weather and rust resistant which will give you long performance out of this tool. 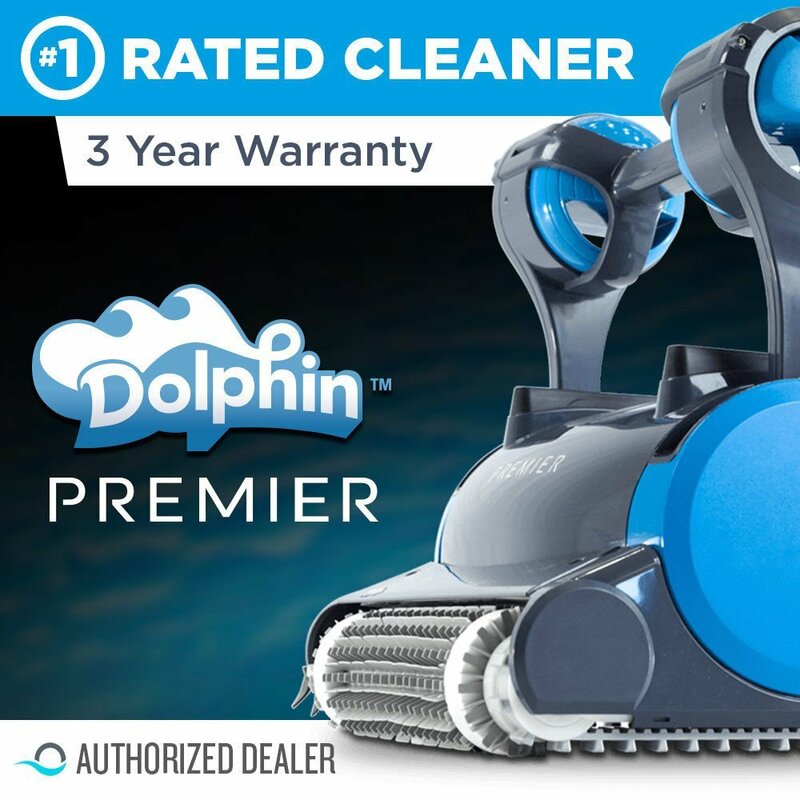 This comes with a lifetime warranty making it a risk-free choice for your aerating needs. The soil and grass in your lawn becomes compact over time. Even if you water your lawn, your grass can appear less bright and turn brown in places if you do not care for it properly. Below we have shared some tips for why aeration is important and what you should look for in an aerator. Aeration prevents soil from becoming too compact. If the soil is hard, then it is more difficult for water or air to reach the grass roots. This leads to a less vibrant and healthy yard. Aeration is the process of digging small, slender holes throughout your yard. These small holes allow for air, water and necessary nutrients to reach the roots of your grass. These holes allow air to circulate through the roots and stimulate growth. 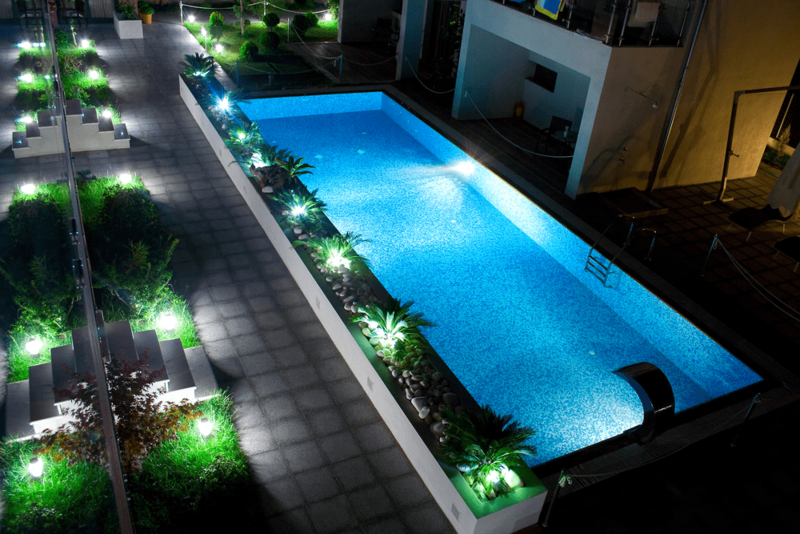 The end result is a bright, lavish green lawn that will make you proud! Not all lawns should be aerated. Since the main purpose of aeration is to alleviate compacted soil, your lawn is a candidate for aerating if the soil is compact. If you have loose soil and your ground is not hard and compact, then your lawn may not need to be aerated. How often should you aerate your lawn? If you use your lawn frequently, then you should aerate twice a year. Most lawns only require aeration once per year. You want to aerate your lawn at the beginning of the growing season, typically in early spring. Plug or core aerators: These poke holes in your lawn and pull out a small core of soil. Pole-style spike aerators: There are pole-style spike aerators that require you to stand on a foot bar above the spikes and push the spikes into the ground. Sandal-style spike aerators: These aerators are made to strap onto your feet. They have several metal spikes on the bottom of each sandal. You literally walk on the lawn with these spiked sandals and poke holes in your yard with the small spikes. If you want to have a beautiful lawn, then consider a manual lawn aerator. There are many benefits to aerating your lawn. The roots of your grass will get more water and nutrients which will naturally help them grow. We have shared the best manual lawn aerators we have found for 2019. Enjoy choosing an aerator and sprucing up your lawn!